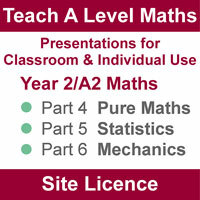 Site Licence for Volume 2: parts 4, 5 and 6, continue from the 1st year to cover all the 2nd year A level work. Modelling is used in all 3 parts with some questions asking students to criticise the models. Two presentations deal specifically with proof but practice is given elsewhere when appropriate. (Permanent licence, not annual).